Home Satellite TV Exact steps to correctly adjust your satellite dish by yourself! Just with a simple digital receiver, it‘s not very easy to correctly adjust a satellite antenna. First, you have to slowly move the dish to the correct position and if the signal is finally available, as soon as bad weather conditions appear, you may lose the picture, or at least it could be distorted because of the not very accurate mountings most manufacturers use. Fortunately, there are a few clues how to correctly adjust the dish with minimal effort. 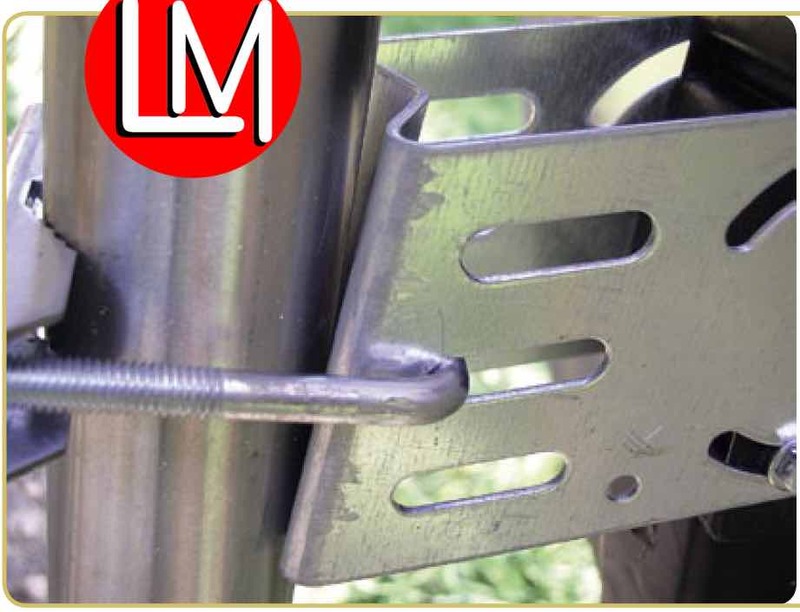 In this article, you will learn the very basics of satellite dish adjustment. Modern Direct to home(DTH) satellites transmit high power signals so that they can be received with small 60cm dishes or even with flat dishes and if there are reception problems, they normally don‘t occur because of the small dish size but because of poor alignment. In the old analogue days, the mounting systems didn‘t have to be very precise. But nowadays it‘s necessary to correctly adjust the dish up to one degree then lock it. To easily adjust the elevation of your dish, most manufacturers add a scale to the mounting, but very often these scales are too small. Most of the scales are also unreadable(see pic above) or you simply can‘t see them during the adjustment process. The situation becomes even worse when you try to adjust the azimuth angle, there‘s no scale available and you have to move the dish until you finally find the correct signal. 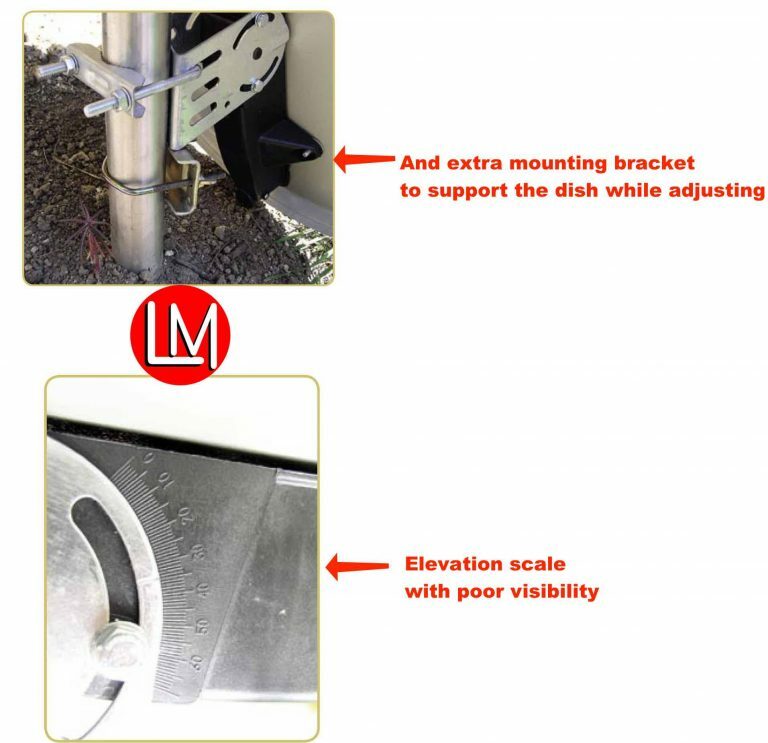 Of course, you can only move the dish when the brackets are open and if the manufacturer used just one pair of brackets instead of two, the dish‘s elevation angle will change while fixating the brackets again.Furthermore, you‘ll soon experience, that the dish not only changes its elevation angle, but it will also start to slide down the mounting pole. In this situation, it‘s hardly possible to adjust the dish by yourself, especially if you‘re trying to mount it on a roof and the receiver is far away in your living room. * You should only buy an antenna with a clearly visible elevation scale. 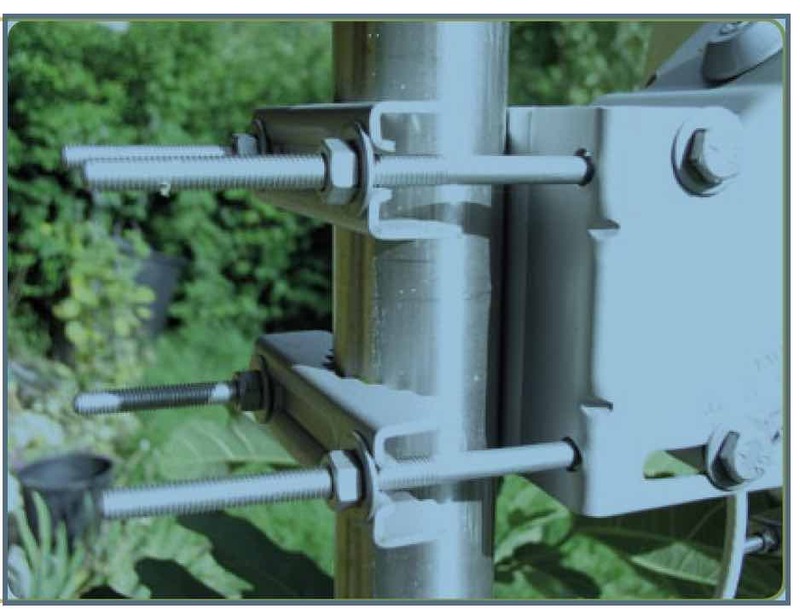 Also, check that the dish uses two pairs of mounting brackets. * Work together and install a communication line between the person operating the receiver and the other one installing the dish. * Find the South direction (in Southern hemisphere you would look for the North) by using a compass, GPS device or construction plans of your house or just wait until noon, at that time the sun will be directly in your south direction (North in the Southern hemisphere). * Find your local geographic data by using software like Google Earth, or if available a GPS device. Hellobox B1 Bluetooth satellite finder comes handy here. You can also use the data of a bigger city nearby, adding or reducing as a rule of thumb 1° for every 100km that you are away from that place. * Use these coordinates to calculate your local elevation by using tools like www.TELE-satellite.com/fxpos.exe and setup that value on the elevation scale of your dish. for your azimuth angle. Now the receiver or your satellite finder should already show a signal, if it does not, just move the dish a little bit further. If you can‘t find a valid signal, your elevation angle is probably not correctly adjusted, so move the dish back to the south, adjust the elevation by 1,2 or even 3 degrees and repeat the whole procedure again until you finally get a signal. The last step to perfect signal reception is the fine tuning of your antenna. It‘s necessary to perform it very accurately so that your dish will also work in bad weather conditions and show you all available transponders. * Nearly every digital receiver shows a quality indicator bar or even a numeric value (normally by pressing the info button), so it‘s again up to your aid to tell you these values while you fine tune the antenna. * If no one’s available to help you can also use one of those cheap satellite seekers, which you have to install between your antenna and the receiver by using F-plugs, so that it gets power from your receiver. Its sensitivity is not as high as the one of a professional gauge, but it‘s ok to determine the best position for an already found satellite. * If you want to change your dishes adjustment frequently to different satellites, you should consider buying a DiSEqC switch. These switches work very accurately in 1/10° steps and you can easily receive all available satellites with just one single LNB. Furthermore, they always use two pairs of mounting brackets. Great dish dealers here, kindly help me determine the exact position of the lnbf for my 3.2m dish with 45cm dept. Good work boss. Do keep it up. Sir do i get lnbf point (focal point) on my 3.2m fibre dish with 45cm deep? @otu: from which location please? How to tracking 3731 H 38333 west for fremier league tv pls?